Are you struggling to find the perfect gift for that creative child? Or you’ve found as your kids start to get older, it can be more and more difficult to find a gift for them that they’re actually going to enjoy? I understand the challenge! Shopping for gifts is one of my least favorite activities, but having a few ideas to inspire me can make it a lot easier. If you have a creative child, then getting them a gift that will unlock that creativity can make a wonderful gift idea for Christmas, Birthdays or any Special Occasion. 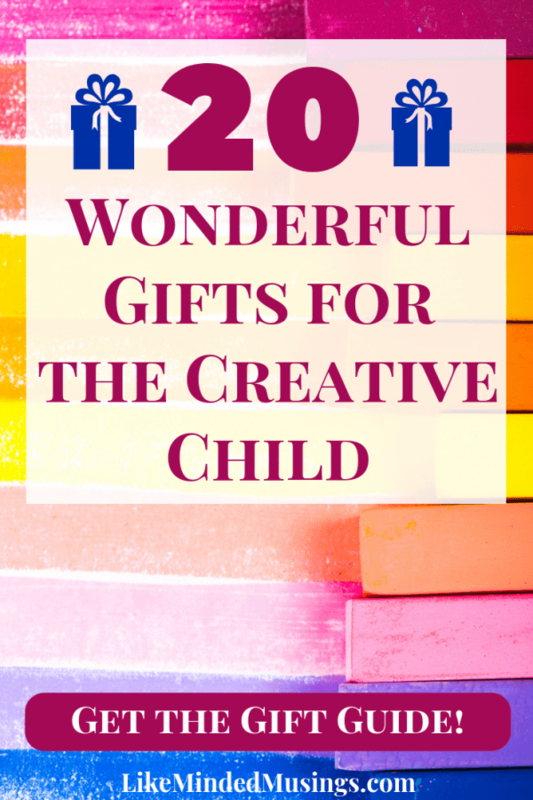 I’ve found 20 wonderful gift ideas for your creative child that they will actually be excited to receive! 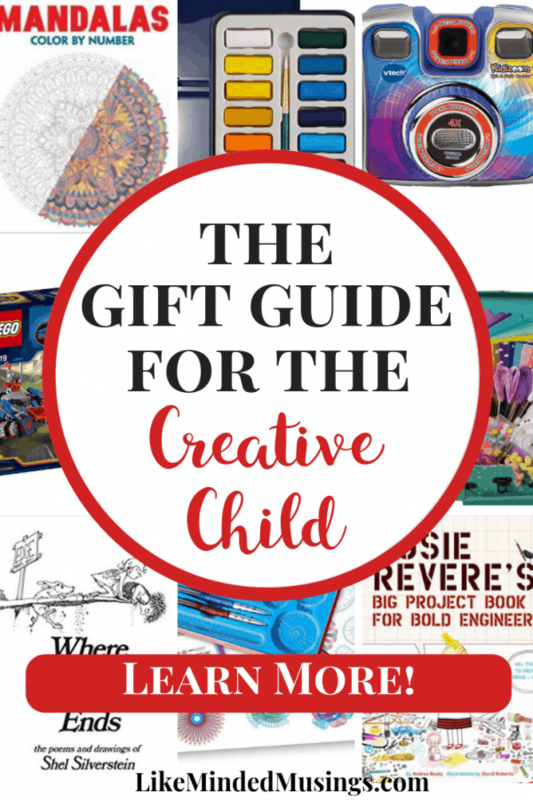 Here is your Gift Guide for the Creative Child. Watercolor Paint Set – Fun for both beginners and more advanced kids, this MozArt Supplies Watercolor Paint Set with 24 Vibrant Colors will provide hours of fun for your child! 2. Sew Simply Kit – Encourage your girl to take the first step in sewing with this super fun SEWING KIT FOR KIDS! With Over 110 Kids Sewing Supplies and a booklet of cutting stencil shapes for the first step in sewing, she will learn and have fun with this gift! 3. Kahootz Spirograph Design Tin Set – Spirograph, seriously need I say more? This is fun for boys and girls, young and old alike! Grab this Kahootz Spirograph Design Tin Set inspired by the original. 4. Snap Circuits Fundamentals: An Introduction to Electronics Circuits – Introduce a Snap Circuit experience with this Snap Circuits Fundamentals Kit! It’s a wonderful way to encourage problem-solving, following directions, and “the satisfaction of a job well done”. 5. Creative Haven Mandalas Color by Number Coloring Book – This coloring book offers unlimited opportunities for shading and color choice! Your child will have hours of creative fun with this book as Mandalas can be among the most challenging designs to color! 6. Paint Lab for Kids – Check out these awesome 52 Creative Adventures in Painting and Mixed Media! This is a great project for Budding Artists of All Ages. 7. Learn to Draw Disney’s Classic Animated Movies – Our kids have loved this at all ages! They can use it time and again as they grow and mature in their skills. Get your Learn to Draw Disney’s Classic Animated Movies for your Kids Here! 8. Cinematic LightBox – Cinematic Light Box with 85 Letters (Extra 85 Emoji Signs) They can use for Home Decor, Photoshoots, Birthday Parties and more! 9. The DC Comics Guide to Digitally Drawing Comics – this would make an incredible gift for the creative children I know 🙂 At last, the first guide to drawing comics digitally! Who do you know that would love this? 10. WOWmazing Giant Bubble Wands Kit – BUBBLES = SO MUCH FUN! Grab this WOWmazing Giant Bubble Wands Kit (they even have a “Kit Plus – Family Pack” for more than one child! 11. LEGO Nexo Knights 70319 Macy’s Thunder Mace Building Kit – This LEGO Nexo Knights Macy’s Thunder Mace Building Kit is 202 Pieces of pure entertainment for your lego builder! Get all of the details and scoop up this awesome kit here! 12. Next Generation Paper Airplanes Kit – Paper Airplanes that were designed to impress! Get this wonderful kit with the book and 32 origami papers + DVD! 13. VTech Kidizoom Spin and Smile Camera – Encourage your growing photographer! There are so many great features including a voice recording feature with 5 different voice changing effects, movie taking, stop-frame animation and more! 14. Faber Castell Do Art Fizzy Paint – This 100 piece set of create your own paint and colors will intrigue any creative child’s mind! Watch the paint bubble and fizz! Use your brush to create beautiful watercolor paintings to share with those you love. 15. Uber Origami: Every Origami Project Ever – This is the ultimate collection of origami projects! Your child will be entertained for hours with over 125 origami projects to complete! 16. Antique Feather Copper Pen – Our daughter had this on her birthday list! This Antique English Practicing Writing Quill or English Calligraphy Pen was a super fun gift to give and see them use! 17. Rosie Revere’s Big Project Book for Bold Engineers – This book has over 40+ things to invent, draw, and make! 18. Leather Writing Journal – Our kids LOVE journals like this with blank pages left to fill with creativity! This journal has Nautical Design with String and Pendants! 19. Where the Sidewalk Ends: Poems and Drawings – You can’t go wrong with the classic Shel Silverstein’s masterful collection of poems and drawings or The Giving Tree! Must have books for every creative child’s home library! 20. Professional Tenor Ukulele Kit – This Mahogany Professional Concert Ukulele Kit is good for Players ages children to adults. It’s a perfect choice for most ukulele players and so fun to play! I would love to know… what are your favorite gifts for the creative child? Leave a comment below! My favorite gift for a creative child would be a ukulele and its learning book .